So this Paleo Challenge has me blogging like crazy and I am sorry if you can’t keep up, but hey you will have lots of good ideas in your back pocket. Speaking of constantly cooking, last night I crafted a magical dinner and everyone in my family ate it right up. Where should I start? I think I will start with the “12” o clock spot on the plate – the pork! To make the pork chops I melted some coconut oil onto a large frying pan and kept it at a medium temp. I seasoned the pork chops (I went by scent, but think about it, this is the entire flavoring so you want to go heavy on the spice rub) and dropped them in. I let each side cook for about 6-8 minutes and then kept flipping until they were donezo. Cauliflower Mash – this is where the awesome new immersion blender comes in. Any other spices – I used a dash of cayenne pepper and then put some Franks Red Hot on mine! I diced up my heads of cauliflower and tossed them in a pot of water with a dash of salt. I brought the whole thing to a boil and waited until the cauliflower was soft. Once the cauliflower was soft, I tossed it into a strainer and removed all that access water. I put it back in the pan and added my dash of almond milk. THEN, I got out the immersion blender and went to town! Relatively quickly I had my cauliflower mash and I seasoned the pot until I liked it. This made a good amount of servings – large enough that four people ate it and then another 2 the next day. From 6-9 o’clock we have the asparagus – this was stupid easy. I chopped a few pieces of asparagus in half. I put a frying pan on medium heat with coconut oil and dropped on the asparagus. I put a little bit of salt on the pan and just flipped the asparagus as necessary until it was at that perfect “crunchy-but-way-softer” state. At 9-12 o’clock we have some organic unsweetened applesauce! This was super easy – I think the whole process took about 30 minutes. All you need is three burners going at once and you are golden! 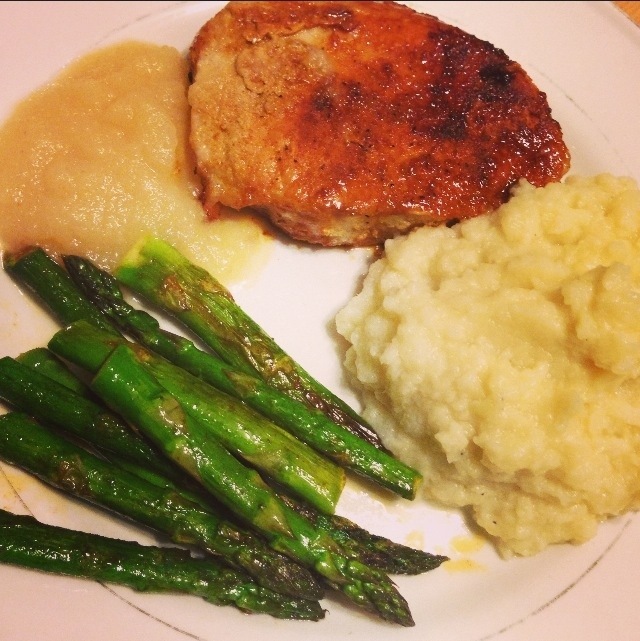 This entry was posted in Dinner and tagged 30 day challenge, asparagus, boneless pork chops, cauliflower, cauliflower mash, crossfit, eat clean, paleo, paleology, pork. Bookmark the permalink.